The problem with using photographs is that it is very difficult to get consistent lighting with the rest of the buildings in the pakset. This is what I made today. Coaching inn 1750 - 1880 level8. Car park -- I made the red P as a neon sign. I would consider changing to white for the 1980s version, though. James -- As to lighting, more like "impossible" ... photos are best used, I am quickly discovering, as "trace-over inspiration" for rendered or drawn images. Archon -- Another winner! Although perhaps with no stone pavement in the rear ... What do you think of an early level-1 stone cottage, or perhaps something with a thatched roof? For the village look. Very nice. I would agree with Dwachs's comments though. Also, as with all corner buildings, it would be great to do non-corner versions too as with your stone terrace houses. I find photos/drawings are best used in blender if you can get the orthographic views and "trace" over them with the objects. That's how I did most of the trains I drew, and some of the early buildings, until I got good enough to be able to do it intuitively. I do like the coaching inn, and agree with W. Lindley's comments on it. One small suggestion: had you thought about producing different versions of it, the only difference being the markings on the sign? That might create some welcome variety with little effort. You would only have to re-do two of the four renders, as the sign is only visible from the two angles. Archon -- if you do two different signs per james' suggestion, you might make them the "corner" and "non-corner" versions in the same .dat file. I am really loving the "corner" distinction. problem with my buildings is that they all seem to end up corner versions. btw. that doorway is for horses, not supposed to go trough building. I think the doorway should go through - normally in these inns there is a stable in the yard at the back so the horse doorway goes right the way through. For non-corner versions, just lop off the bit at right angles - the sides can be boring as they will be next to other buildings. I think the doorway should go through - normally in these inns there is a stable in the yard at the back so the horse doorway goes right the way through. Which makes it very easy to make a later version of the same building - just replace the horses with parked cars! Latest version of coaching inn. How about this 1600s stone church? Looks good, but I'd reduce the tower height by about half or maybe more. 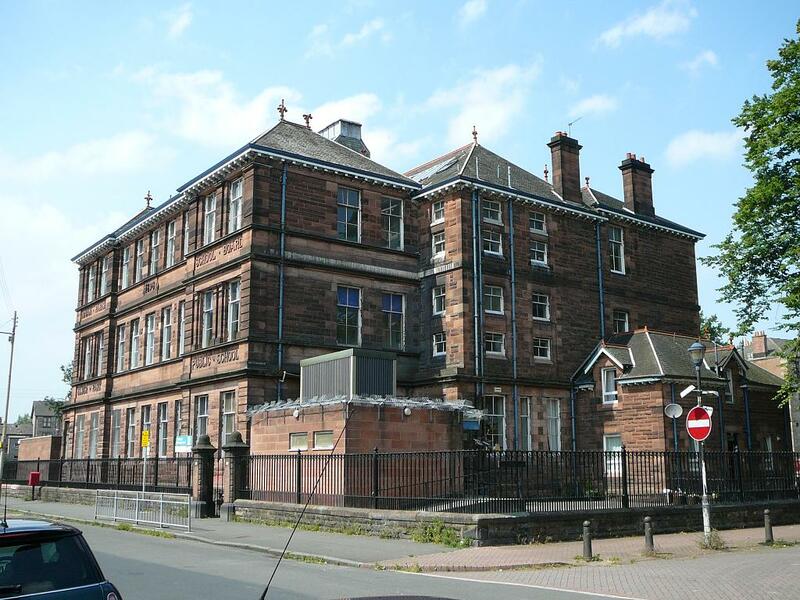 Also probably best coded as a curiosity rather than a citybuilding. Finished snow images for C inn. All buildings in one zip. Right, ... coding it as a curiosity, starting with the 1980s church .dat as template. Also as a larger version, which should have an accompanying walled church-yard ... work in progress. i have found some excellent shortcuts that are making pixel-editing a breeze. No current plans for new townhalls. I don't think the current style is out of place anyway, just there are plenty of other styles that could be used as well. Looking good. I'd make the larger one a 2x2 (with yard). 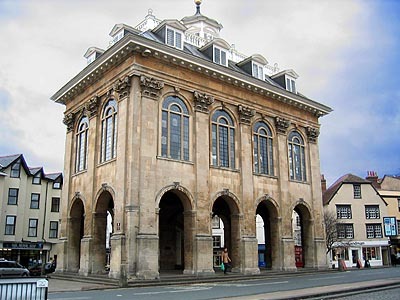 The current town hall is based on St. Albans Town Hall. I tried to work out a progression of images by which the building would be upgraded (the actual prototype is I think the 2nd last stage). 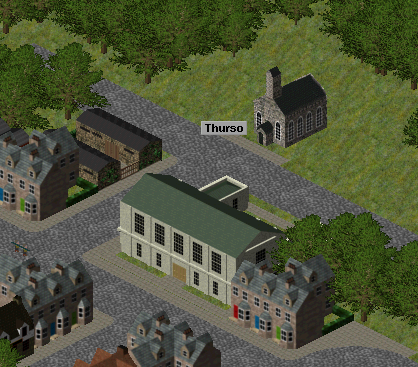 Reasoning behind this is that Town Hall should be quickly recognisable, if town halls vary wildly between levels then it becomes more difficult to find it. That said I think there'd be a strong case for having a medieval style town hall and a modern style town hall in addition to the current one to cover different time periods. I'm sure the existing model could be improved as well. 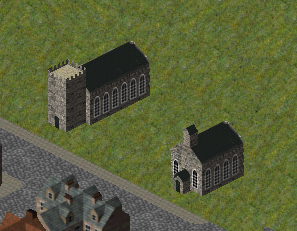 Also, and I will repeat this again, Archon's buildings do not fit the rest of the pak buildings completely - that's not to say there's anything wrong with them design or detail wise (both of which are great) but something in the rendering setup makes them appear more blurry (compare the windows in the screenshot above - on wlindleys church, The Hood's farm, my town hall and pub they are all a lot sharper than on the buildings from Archon). In the light of Kieron's comments, could you make the final .blends you used in your render available so I/we can do some tests? You'd also need to include all the textures you used etc. I really like the stuff you are doing so it would be great to iron out any minor style differences between your stuff and the existing stuff - especially as it is all 3D models and therefore fairly easy to adjust. As another comment, I notice that none of the snow images have pavements - could you add a snowy pavement texture to each of the snow images? Here it is (hopefully with all textures). I already made some modifications after last renders(disabled filtering for textures). Also I used ray shadows for C.inn and those are still enabled. Thanks! Not sure when I'll be able to take a look (I'm busy the next few evenings), but maybe Kieron will get chance (and I he set up the render settings in the first place so he might be able to find differences quicker than me). Is there snow version of sidewalk? I tried to find it from svn but can't find it. My next project will likely be old brick school. It will be 2x2 curiosity building. Not on SVN, as the sidewalk itself doesn't support snow images, bizarrely. If you take the pavement and add a pale grey musgrave texture that should do the trick. Nice idea for the school - looking forward to it. Interesting how the modern addition for the air-handler follows the original design and materials. I guess that would be only in the 1960s version of it! City parks are generally a good idea, and again larger than 1x1 is probably better. I'm not sure about the one in that image though - (a) it does look a bit too small and also the telephone box is too bright I think. I've looked at your blends and there are a few differences in render settings. The key one is the antialiasing filter size. Yours is set to 1.00, whereas mine are set to 1.50. If you increase to 1.50, everything looks a little less blurry and suddenly fits in the style much better. You may need to adjust some other texture settings though elsewhere to compensate. The other thing to alter is to set all interiors to pure black (RGB=0,0,0). The render below is with those two changes made. Should someone make snow image for sidewalks just in case it will be supported later? It seems little task and would make pak more consistent if it was used as base for buildings winter images. Also I didn't get what you meant with setting all interiors black. The surface for all windows should be set to render as pure black. This means the material should be set to V 0 and as shadeless. preview of 2x2 church. add some gravestones in churchyard, perhaps? or...? As per a comment I made earlier on, you need to show the shadow line from the roof overhang - in this case on the gable end of the ?vestry? At the moment you can't see any evidence of tiles on the surface facing away from you. Also, what material are these church roofs? They are very black, even for slate (compare Archon's slate roofs). I can't imagine it's meant to be roofing felt! You could always give the larger church a lead or copper(malachite) roof, of course. Also with churches, if it's easy to do(? ), you might want to make sure all game-churches align the same way (ie east-west). 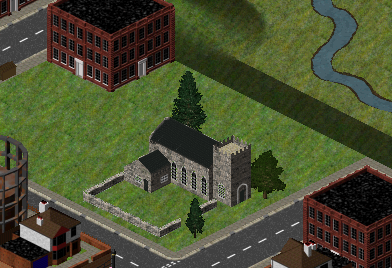 Looking better, although I'd make the churchyard fill up most of the 2x2 (doesn't quite look like it does at the minute). After that, add some gravestones, a path, and I think some more detail to the tower (like a clock and gratings for the belfry). It would be possible for all churches to face East by only specifying one direction, but then they would look the same when everything else rotates, so I'd prefer a full 4 rotation image. In any case, there are enough churches in the country which don't point East for me not to worry about that too much! Render no "lost count + 8"
If jury thinks it has everything right I will render rest of my buildings with these settings. This jury member votes in favour sorry if we've been trying your patience, but it's good to get it right (I struggled a lot with that at first too). Hopefully you have it all set up right to never have to worry about it again now. i don't quite understand this, shouldn't this be actually the other way round? all rotations are needed to keep it oriented into the same geographical direction while turning the map. the offtopic that really surprises and interest me however is that many english churches don't have their apsis in the east. 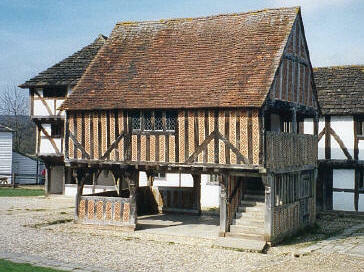 is this through all periods, or only for some architecural styles/aeras? oh, btw, the new city buildings all of you made look really good. this will greatly improve the pak!